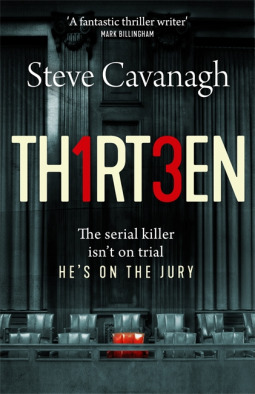 Just listen to this shout line for this book - 'The serial killer isn't on trial, he's on the jury' - I mean, whoa, how scared are you now? I have wanted to read this since I first heard about it as it sounded such a great premise for a crime novel! Now here's the rest of the blurb - I have to share it with you because it's just so enticing! As you would expect from this blurb, this is a fast paced, action packed thriller with a gripping storyline and punchy prose. It's gritty - or should that be, grim - with a fair amount of violence so it's not for the faint hearted but all the grit and violence is totally necessary in creating the chilling and unnerving character of the serial killer and the vivid atmosphere of the book. I don't want to give too much away which is tricky because actually there is quite a complex plot at work in this novel. 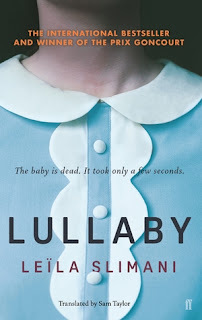 It would be hard to talk about it without spoilers but I was pleased to see that despite a detailed blurb which whets your appetite, the book is full of more layers, twists, complications, interactions and sub plots than I expected. There are also quite a few characters to get to grips with and we see events from different points of view but, despite the pace and the rapid pace created from the short chapters, each character has a distinctive and strong voice so the reader is never lost. The characters are not particularly appealing but definitely edgy and fresh. There is a lot of energy in the pages of this novel with great dialogue which feels authentic and real. The voice of the killer is very effectively created. The reader spends quite a lot of time in their head and I found the cold blooded nature, or the rational way in which irrational behaviour was justified, completely compelling and simultaneously terrifying. I liked the location of the novel, it was easy to imagine and easy to picture. I was totally unaware that this was book 4 in a series but clearly it works as a stand alone and I didn't feel that I missed anything from not having read any other books by this author - something I intend to remedy very quickly! This is fast paced, gritty legal thriller which feels original, new and full of energy and vigour. It's well plotted, well structured and well written. Perhaps not my usual read and perhaps I was a little unsettled by some of the violence but I was quickly drawn right in by the characters and the writing and it was a real pleasure to discover a new series and a new writer. 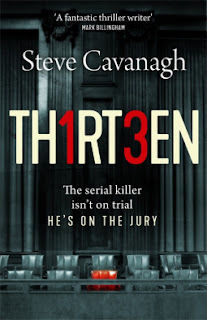 Thirteen by Steve Cavanagh is published by Orion and is already out in ebook. The paperback is out on the 14th June 2018.